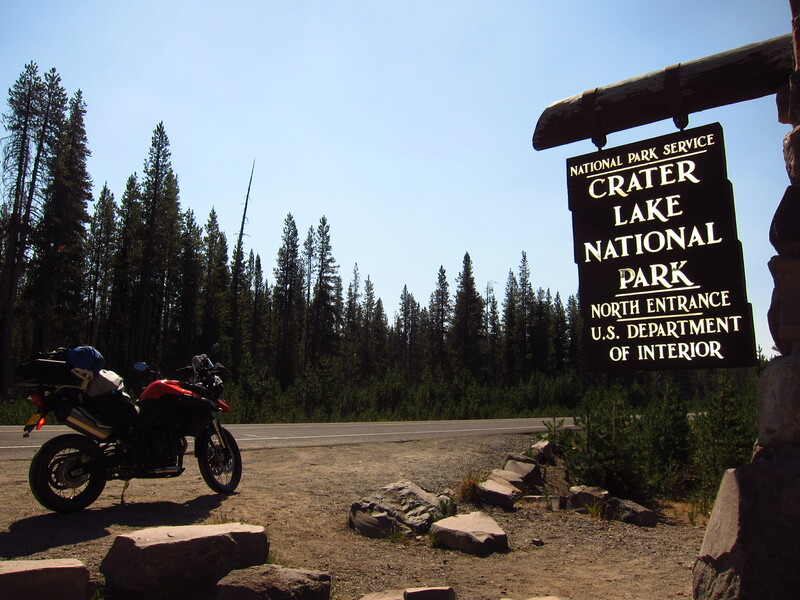 Leaving the Metolius River area [Sunday, September 2] I rode south towards the Crater Lake via 97, following along the transition between the Cascades and the Oregon’s high desert. 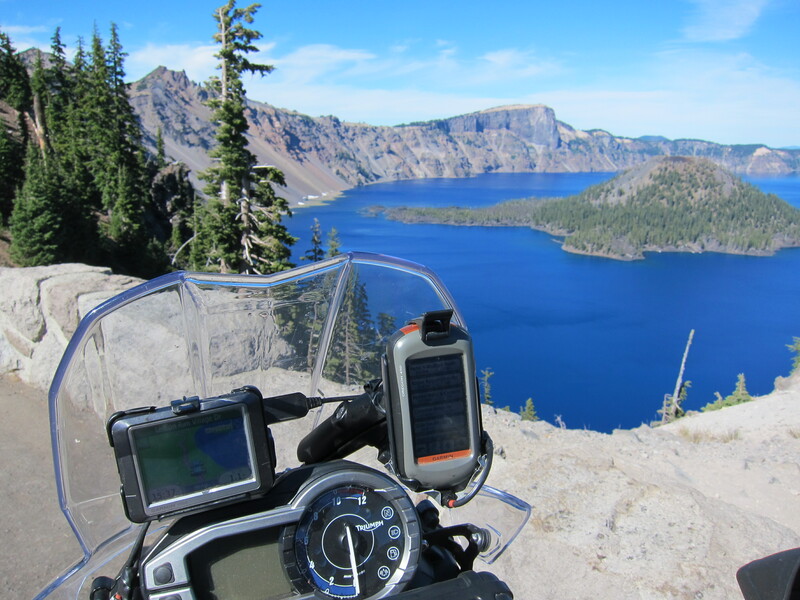 An uneventful ride, the miles easily go by on this bike, I arrived at the entrance of the Crater Lake National Park at around 4pm. Since this is a holiday weekend, I was expecting to see some traffic, and I noticed when I turned into the final road towards the park some more traffic, but never imagined an actual traffic jam. It was the line for the booth at the Park Entrance. A bit surreal to find this on an otherwise very low traffic area, but the line moved fast, and I was glad when I learned motorcycles are not charged, only the rider. Not so bad, $5 was the cost of admission. And I got more value than that for this short visit to the park. Even if this was my third time in this park, I still had a chance to experience things as if they were new, so grandiose and beautiful and unique this volcano is. 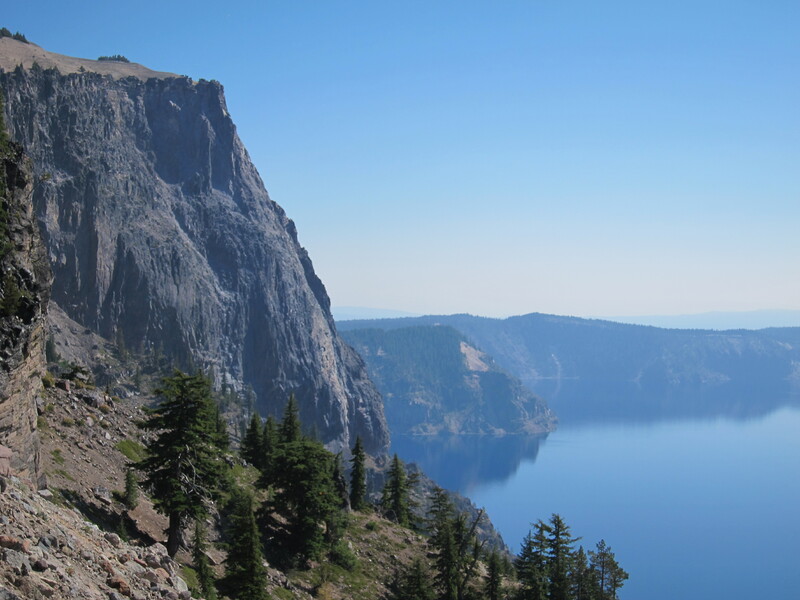 Most people in Oregon and surrounding areas know about the Crater Lake. But others in other parts of the world may not know. So here is the quick and dirty about it. 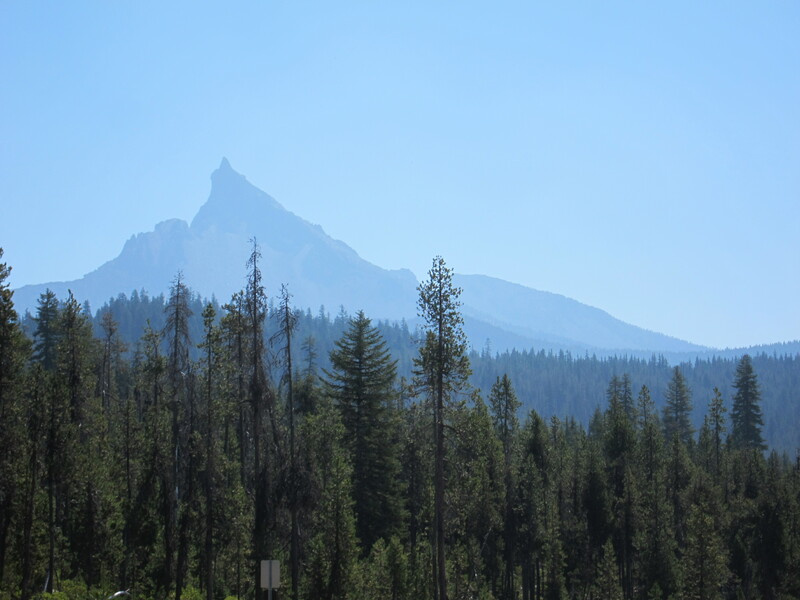 This was a volcano, the Mazama, and it erupted 7,700 years ago. 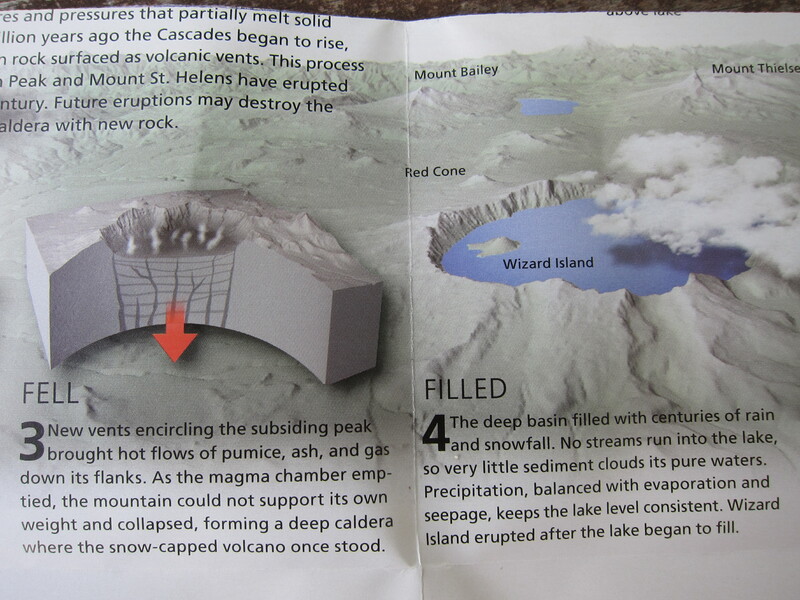 The top of the volcano exploded and collapsed, creating a large and deep depression. 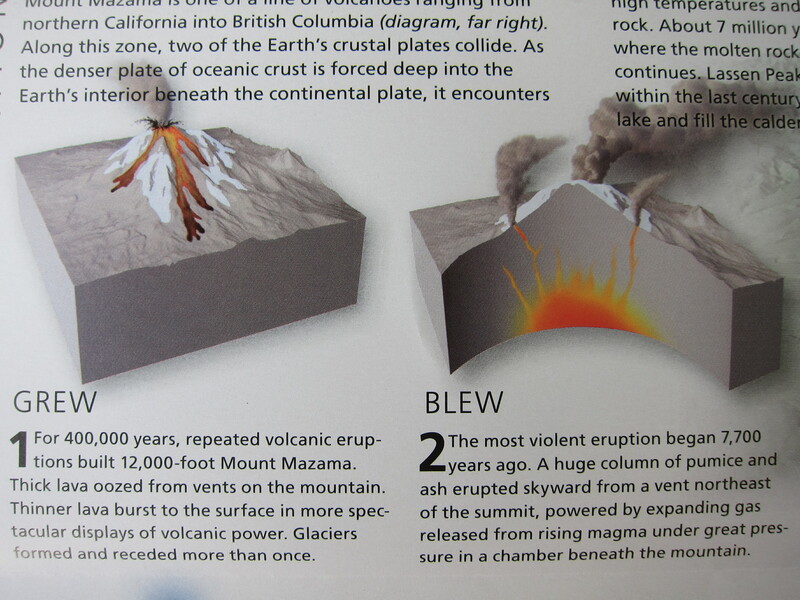 This depression eventually filled with water from rain and snowfall (there are no springs or other source of water contributing to the water volume in the lake). 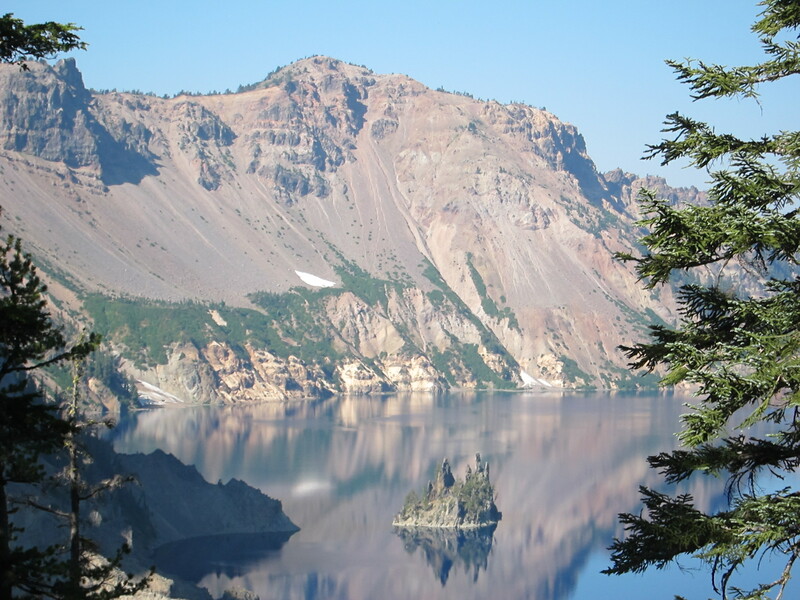 At a depth of 1,943 feet, it is the deepest lake in the United States. And the deep blue color you see in the water is phenomenal. 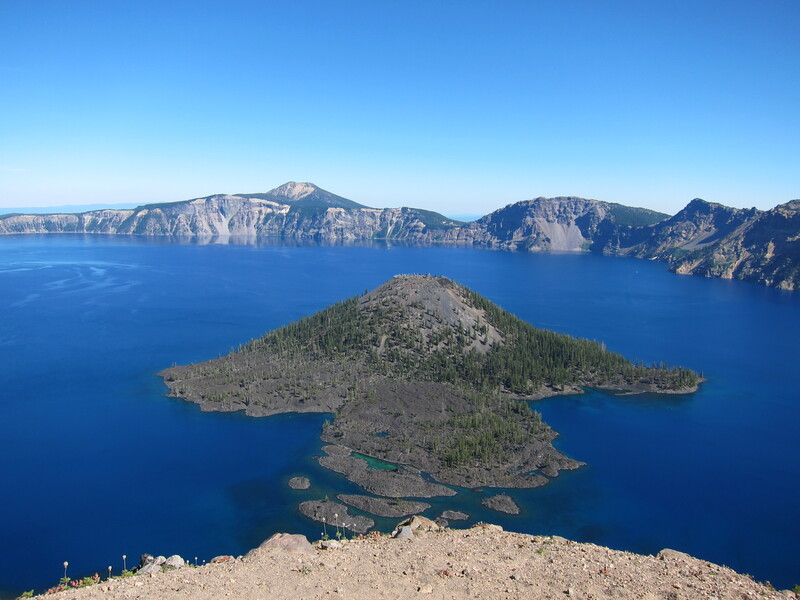 The small island, called Wizard Island, in the west side of the lake was a later formation, it was formed and erupted after the lake began to fill. 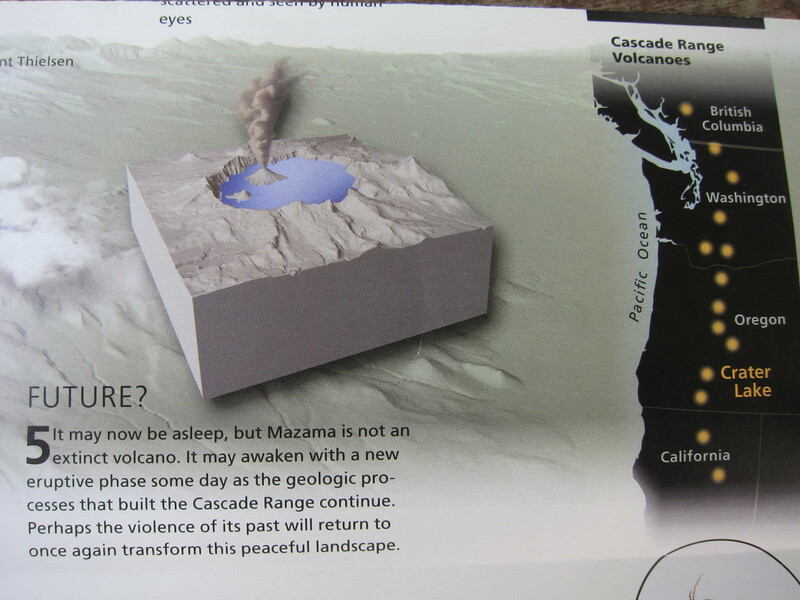 This volcano is not extinct, like several other volcanoes on the Cascades range. Who knows what this lake will look like in the future? While climbing towards the rim, arriving from the north, I stopped a few times to take pictures. I could see some snow on the north slopes of mountains survived the summer. The views are fantastic in this area. 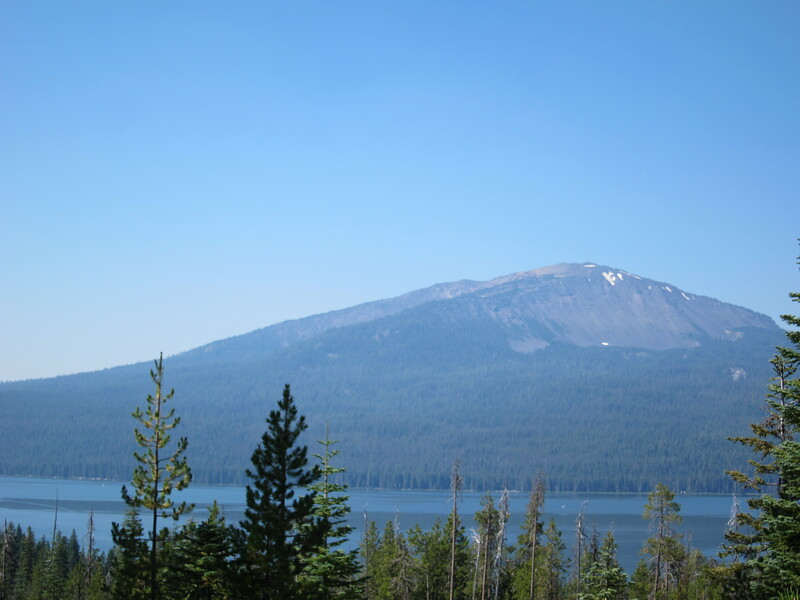 The photo below shows the pumice desert. Pumice and scoria ejected from the eruption accumulated here, forming this desert. Some of these rocks traveled as far as 25 miles (40km). 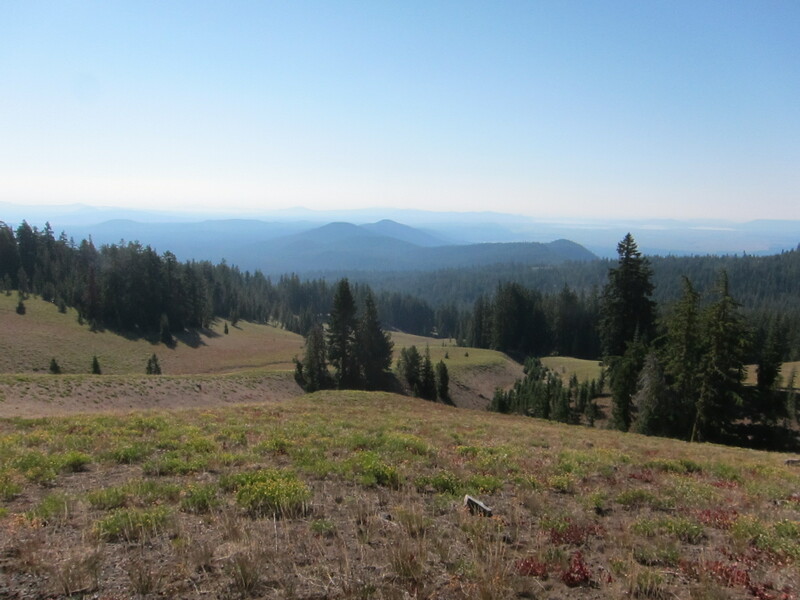 My plan was to ride towards the rim and descend towards the Mazama Village on the west side and see if they had a camp site available. 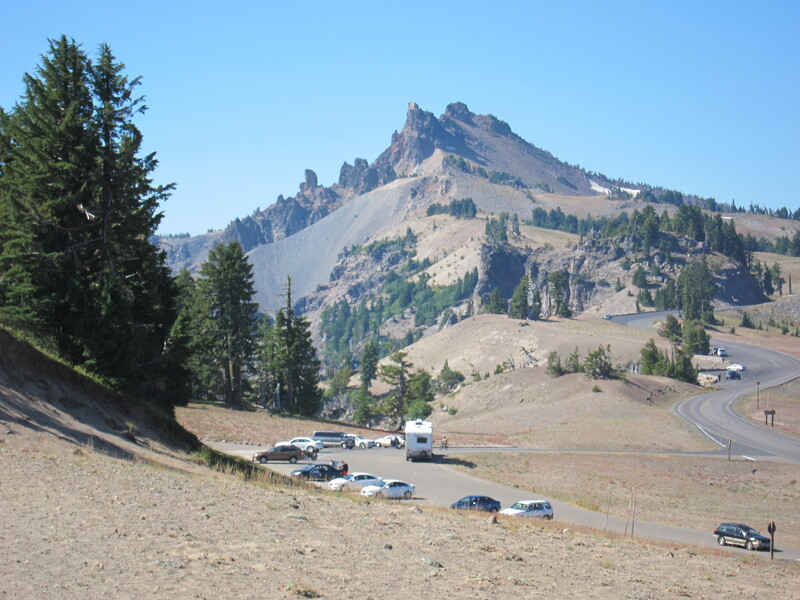 I had made no reservations, but I knew of other camping sites in the area, as a backup plan. 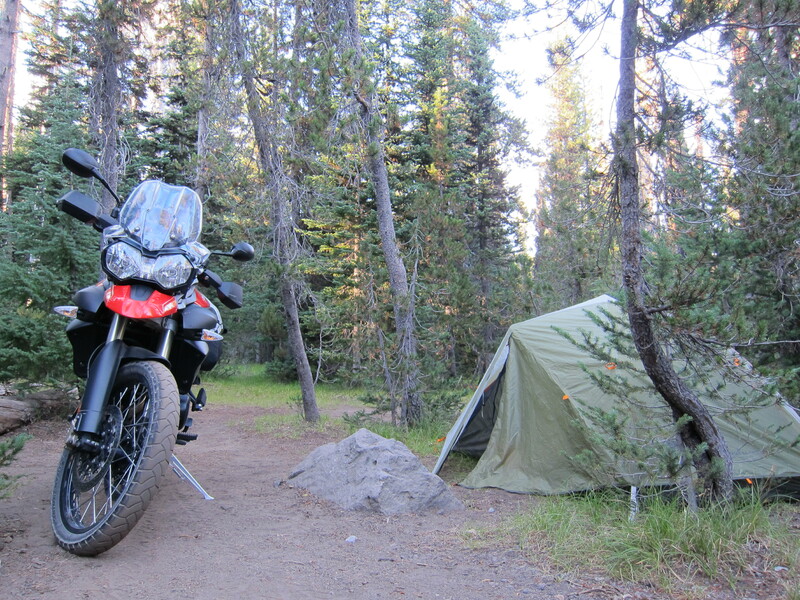 Back in 2008 I had been here and had camped by Rogue river, at the Natural Bridge campground, not too far from the Mazama village. With these thoughts in mind I continued towards the rim, stopping here and there for more photos. I stopped to document some bits of surviving snow on north slopes. I finally reached the rim of the volcano and I was able to see the beautiful views of the lake. Yes, I tend to like pictures where the motorcycle I’m riding is part of it. But I could be safe to think people would like an unimpeded view of the lake. So here it is. Because my camera’s lens was not wide enough, I will show it in three pictures, going from left (north) to right (south) as viewed from the west side of the lake. 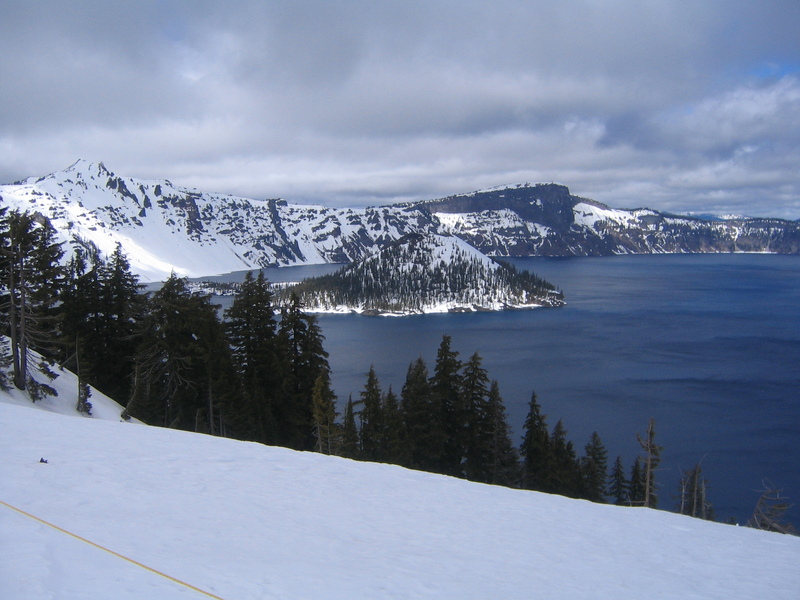 Then north area of the Crater Lake. Looking towards the east, with Wizard Island, which was formed as the lake was filling, right in front. 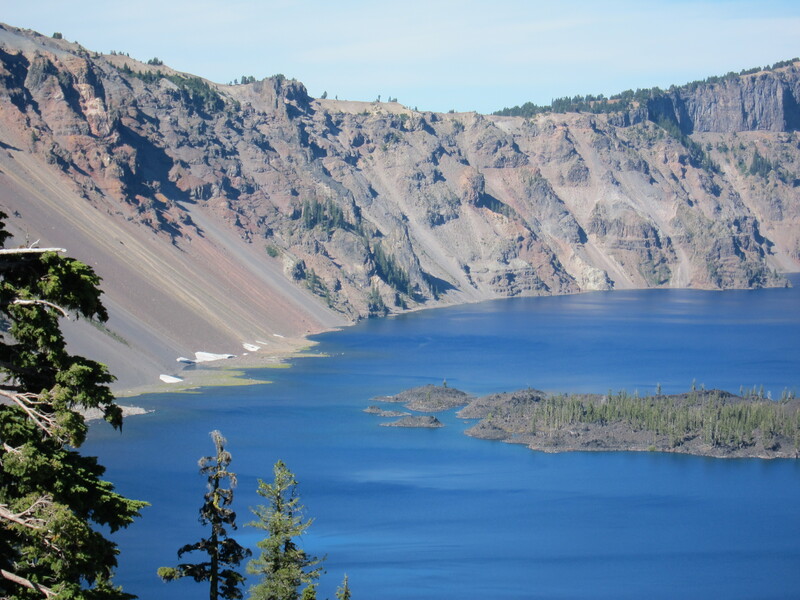 And on the right of the photo below is the south area of the Crater Lake. Before getting into the campground, I wanted to take advantage of day light and see more of the lake and take more photos. 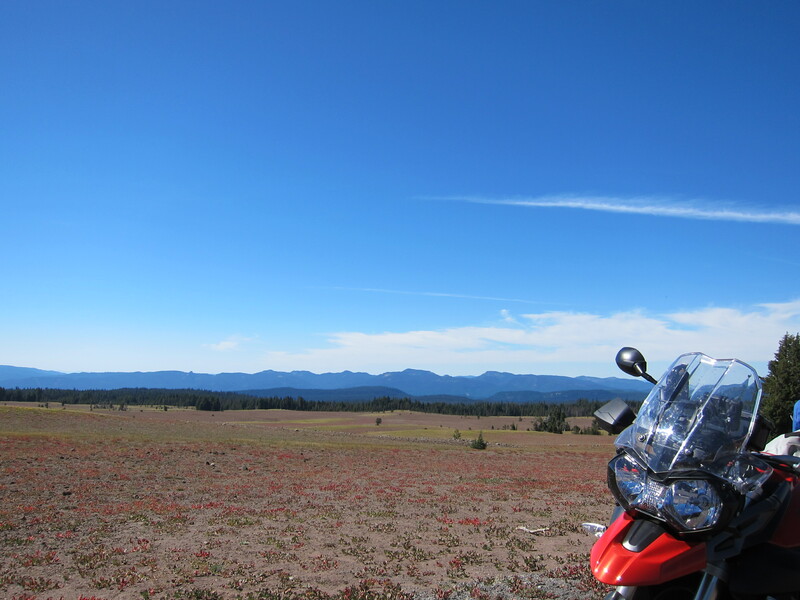 I continued riding the rim towards the south. 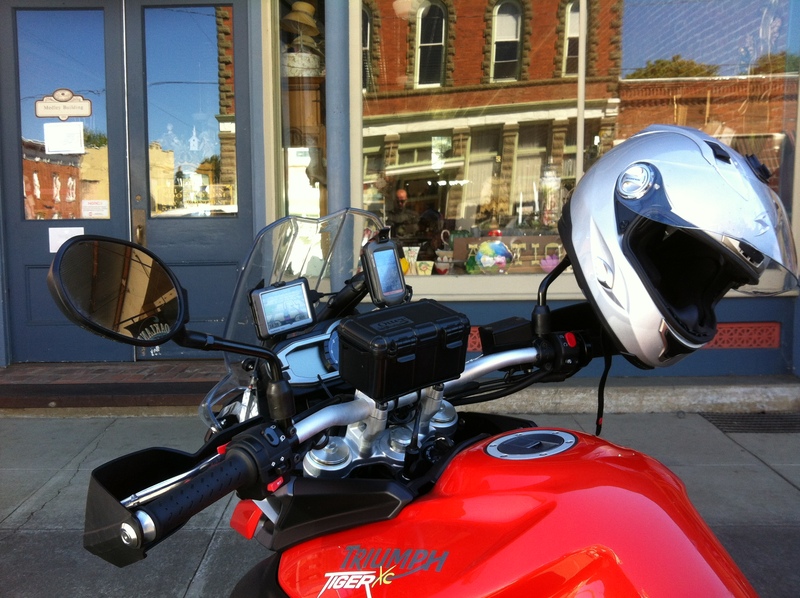 Some people ask me why do I need two GPS units. 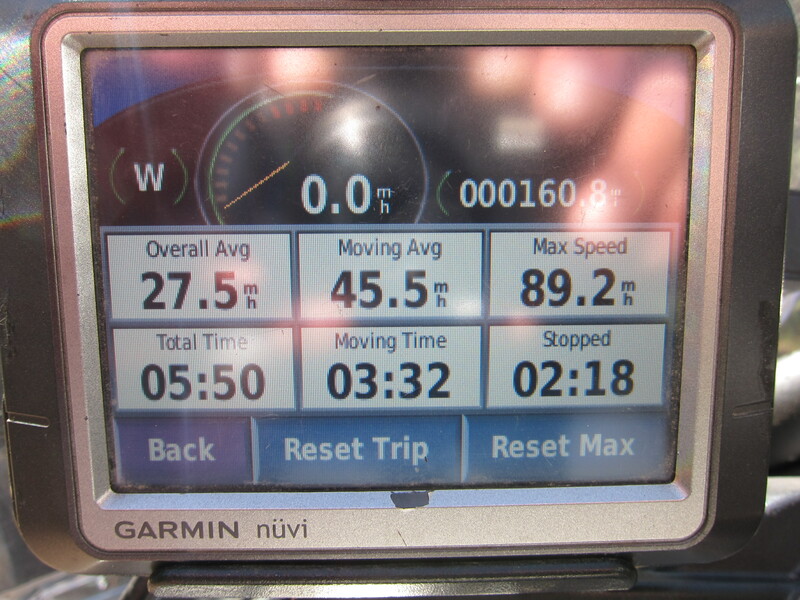 I have no answer, except that I like data, and with two GPS’s I can see the map in one and trip data on the other. Also, the car GPS (the one on the left) is much easier to navigate for logistics such as finding campgrounds, fuel stations, restaurants, etc. 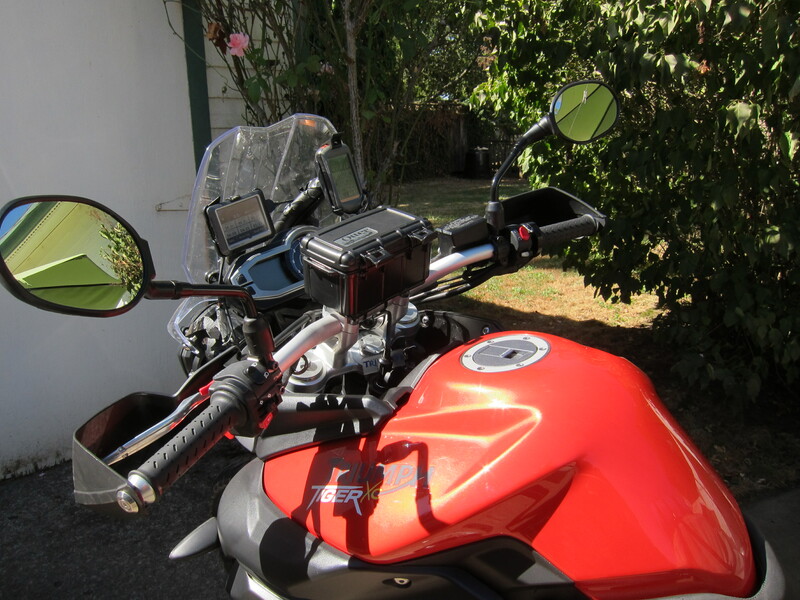 While the motorcycle/hiking GPS (the one on the right) has better routing and tracking maps for navigation when paved roads are absent. The motorcycle cockpit and the Lake. But what was that on the background? Some more surviving traces of snow. I have been here in the spring of 2007, when only a few roads were open. 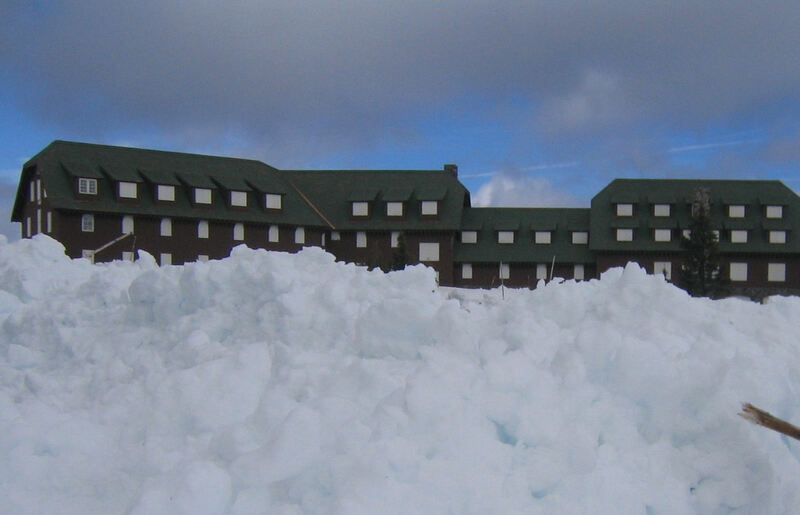 This is what it looks like with snow. 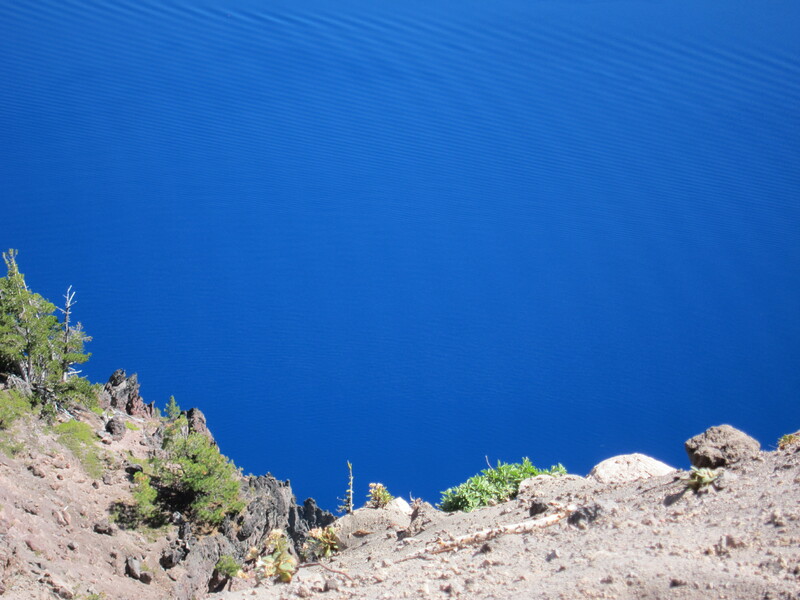 It is difficult to capture the deep blue color of the lake. The picture below is my attempt. Doesn’t it look like this is a sky view? Instead, I was looking down towards the lake. To my friends in Mortelle, Italy, at the Straight of Messina, who are always trumpeting about the blue color of the Mediterranean by their house, this one comes really close (I won’t dare say it is a more beautiful and deeper blue color, because I know I would hear back from you). Enough playing, it is time for me to go find a camp spot. 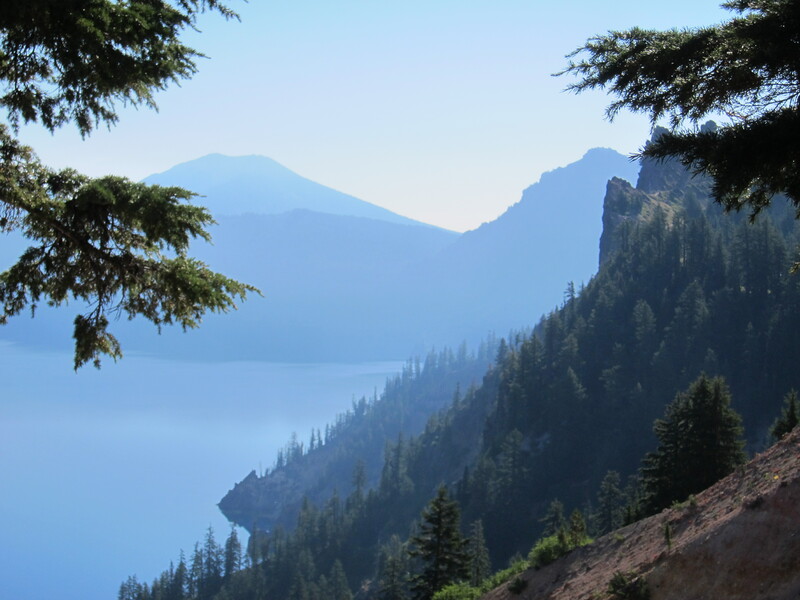 I went down the rim from the west side of the lake towards Mazama Village. There was a line at the campground booth, but the attendant said there were camp sites in the RV area. I asked for him to reserve it and went back to the bike to get my wallet. By the time I was back at the end of the line and finally talked to the attendant again, there had been a cancellation and I lucked out on a tent site. Just what I needed – the idea of spending the night with RV’ers and their generators was not inviting. The RV site would had cost me $27. The tent site was $21. In total, today’s ride was 160.8 miles (259 km). 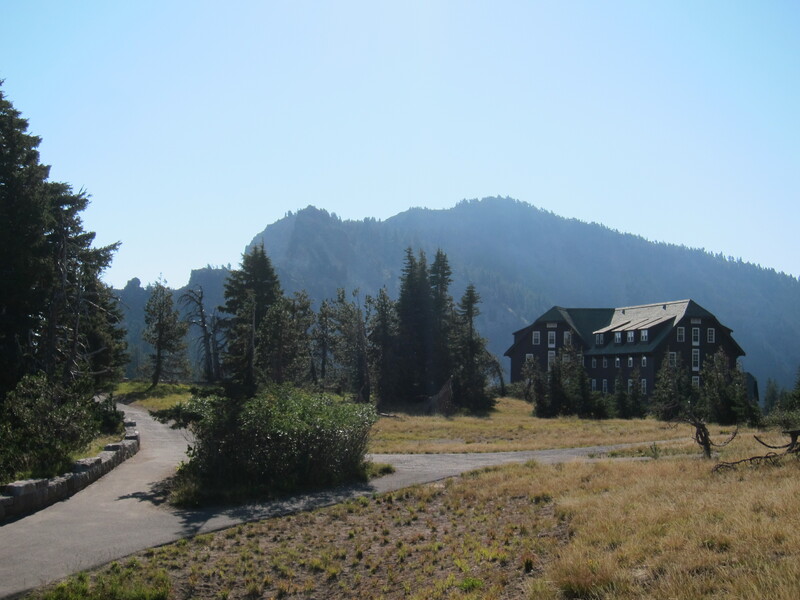 After setting my tent I walked towards the Mazama Village. When booking the campsite I noticed a convenience store and a restaurant. 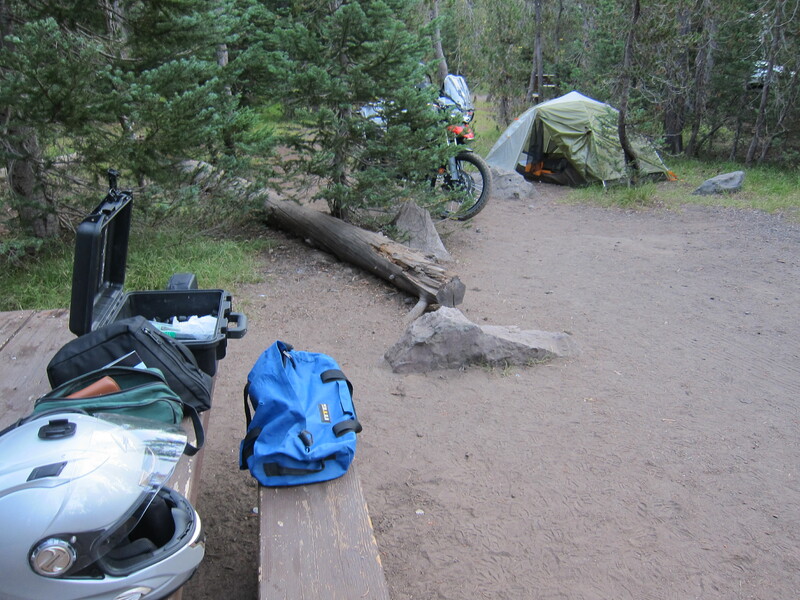 I had brought with me freeze dried food, I had water, I had my jetboil stove and I had a couple of beer cans. But I was leaning towards going to the restaurant, where I had seen an outside seating area. I chose an outside table, next to me was a young couple from France. 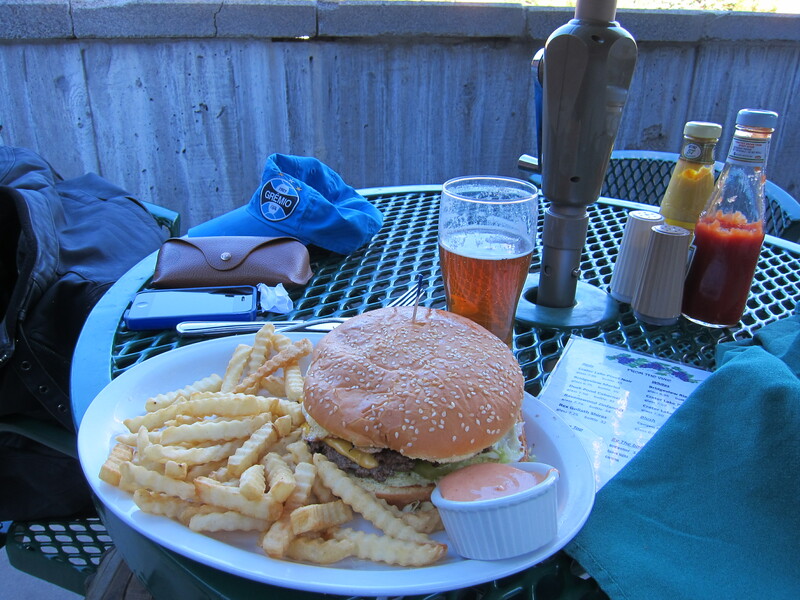 We chatted a bit about our travels and I ate a hamburger, bigger than my head. 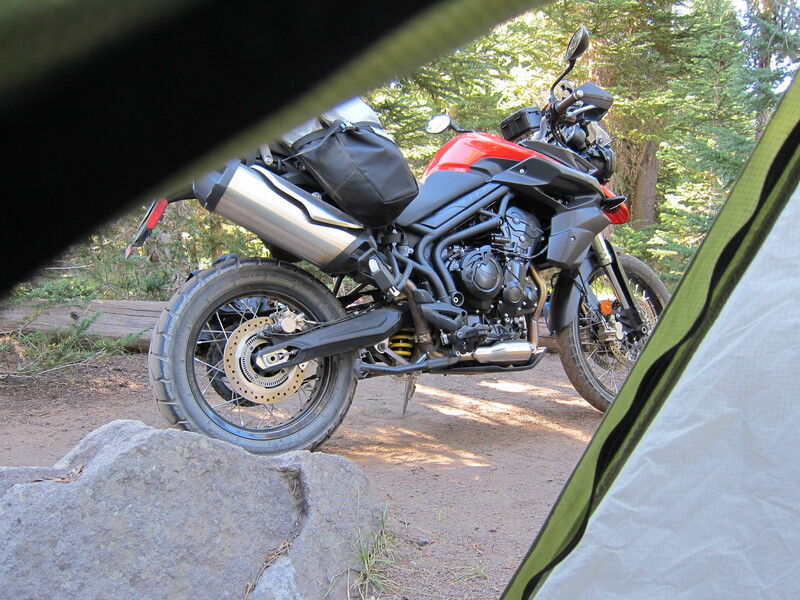 Back to the site, I went inside my tent, did some reading and fell asleep early. It was a good night, not as cold as the previous night in the Metolius River area, despite being here at higher altitude than the night before. I got up early, sorted my gear and re-packed everything slightly differently and all of a sudden I found some more room. This is always the case on my motorcycle trips. Well, it happens on any travel I do, actually. I had a cup of coffee and got ready. The plan was to go back to the rim, go east and then back west towards the north exit. 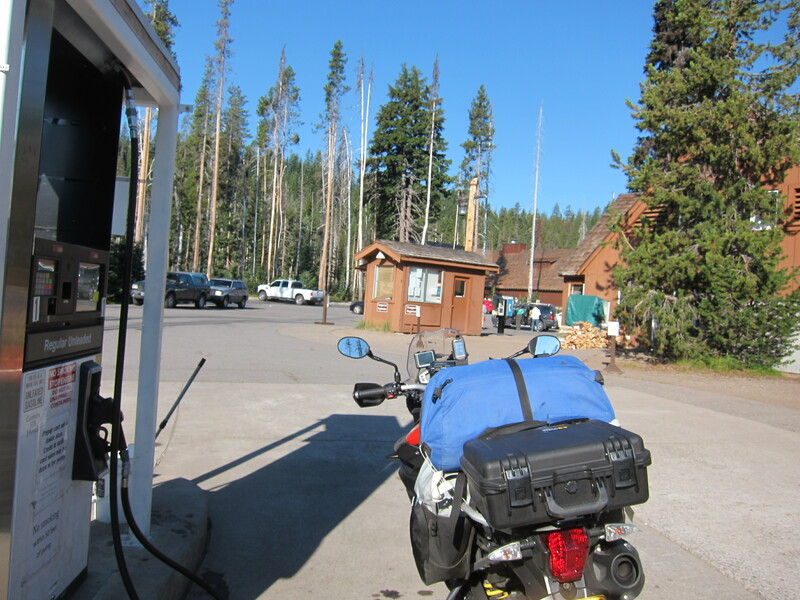 I refueled the bike right at the Mazama Village and rode back up towards the rim. Filling the tank. On the background, the booth for checking in at the campground. When back towards the east rim road, but only just up to the Phantom Ship overlook. It is hard to imagine, but that little Island down there, the portion we see out of the water is equivalent to a 13 story building. It is difficult to portray to scale the dimension of this lake. Views from the rim, looking towards the south east area. I turned around towards the west and from there to the north of the lake. On the way I checked the Lodge on the east area of the rim. It closes during the winter. 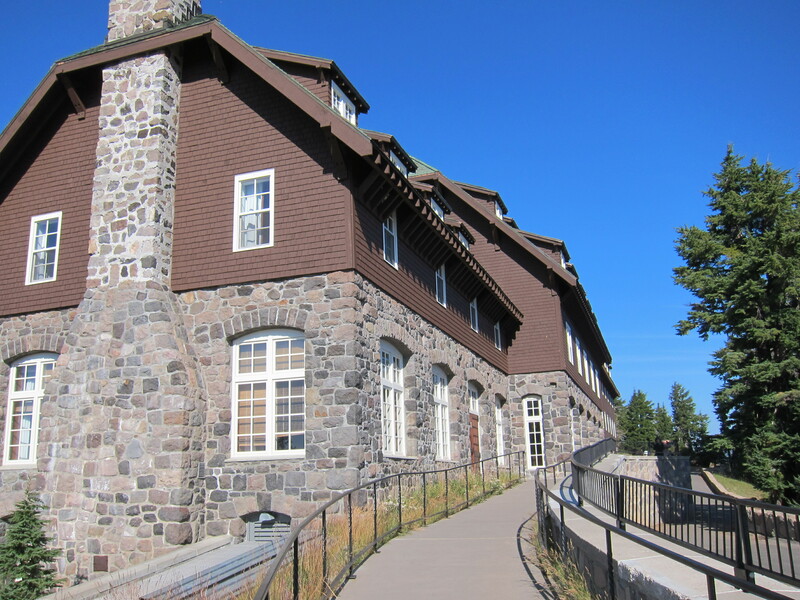 The Crater Lake Lodge in the Winter months. March 2007. 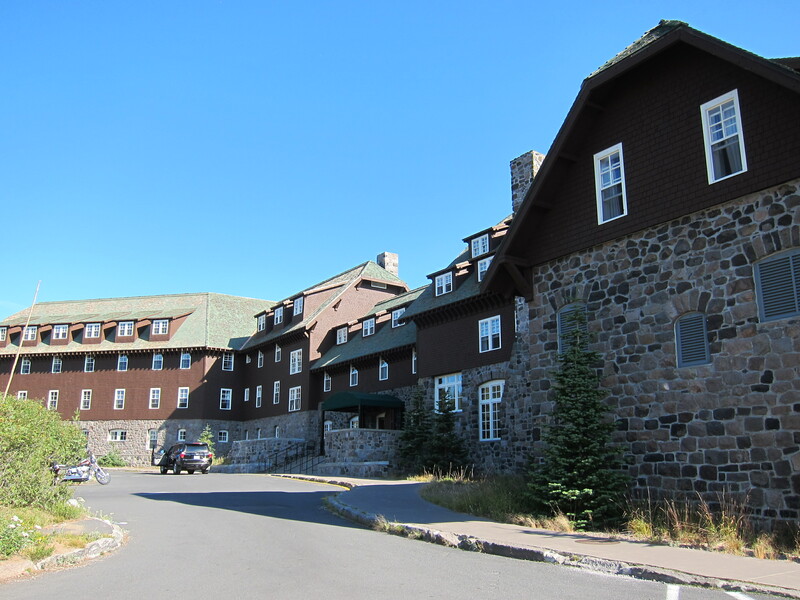 Looks like a nice place to spend a few days in the Summer and hike the areas around the lake. What about a cup of coffee in the morning, with this view? More views of the lake before I say goodbye. I was re-tracing my route from the day before, the plan being to exit the park back via the north gate. 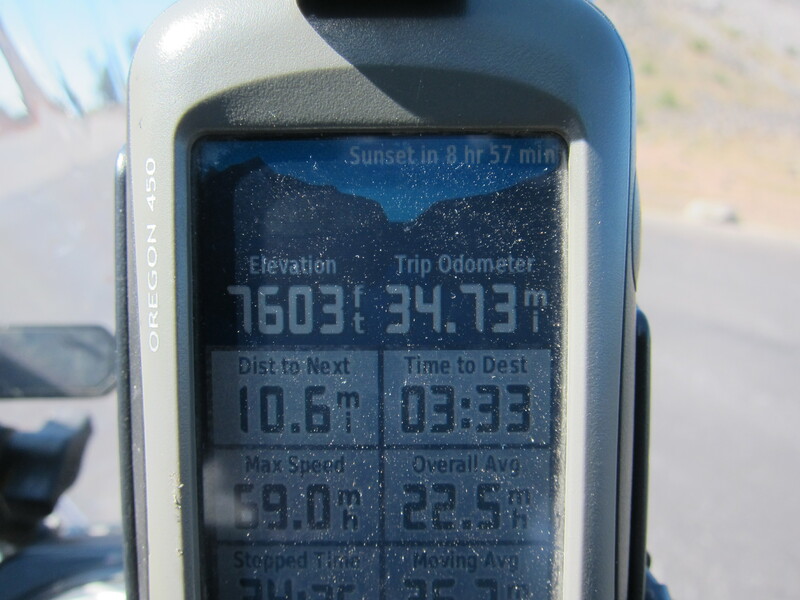 At some point I captured what I think was the highest elevation on this ride. 7,600 feet above sea level. Roughly 2,300 meters of elevation. 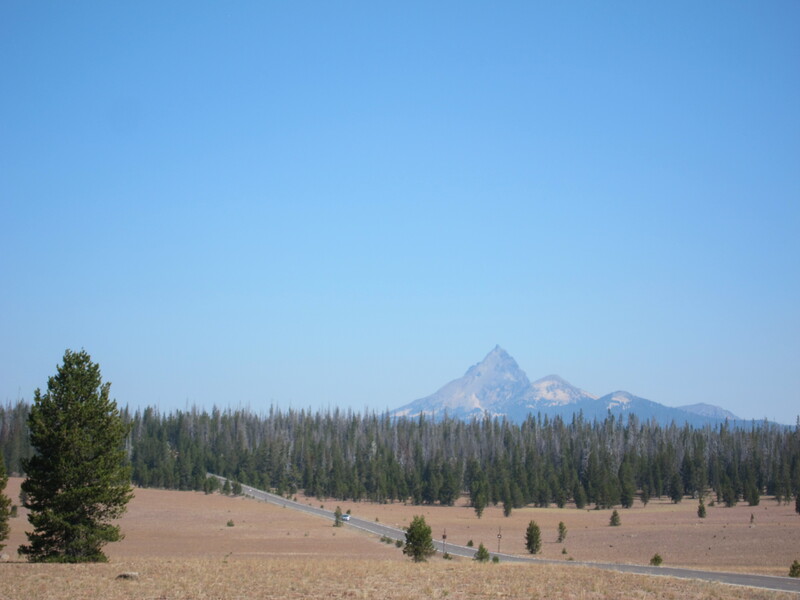 Views of the road around the rim. One final view of the lake. And a view of the road, from that point, looking south. I exited the park at around noon and had to make a decision. I was not sure where to go next. Well, I had to go back home, just didn’t know how ambitious my return would be. In the end, I took the most direct route that did not involve a free-way, and added some diversions to it. I took 138 towards the west and made a few stops along the way. 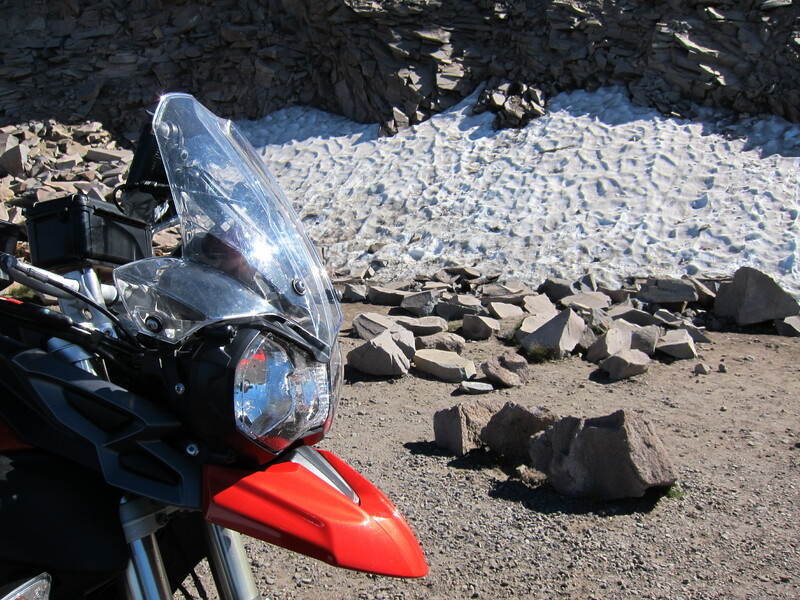 Went between Mt Thielsen and Diamond Lake. 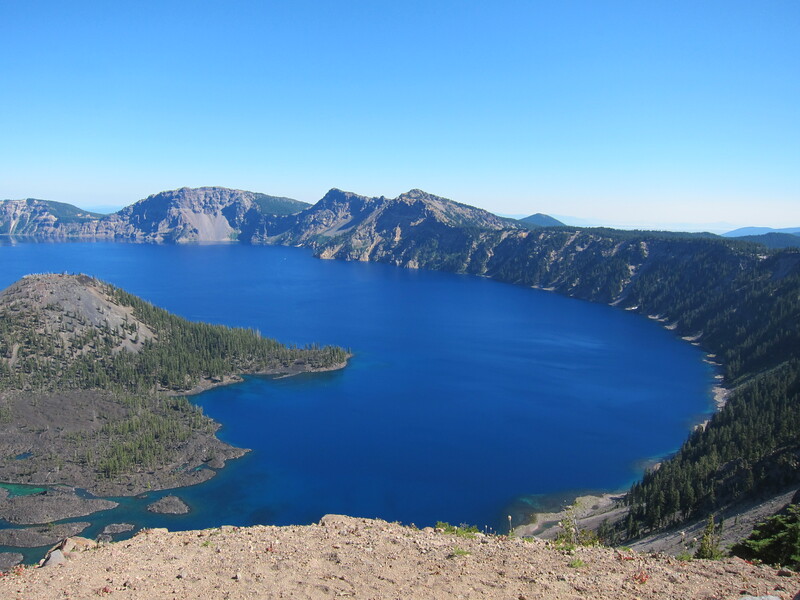 The Diamond Lake, 12 miles away from the Crater, was formed during the eruption. 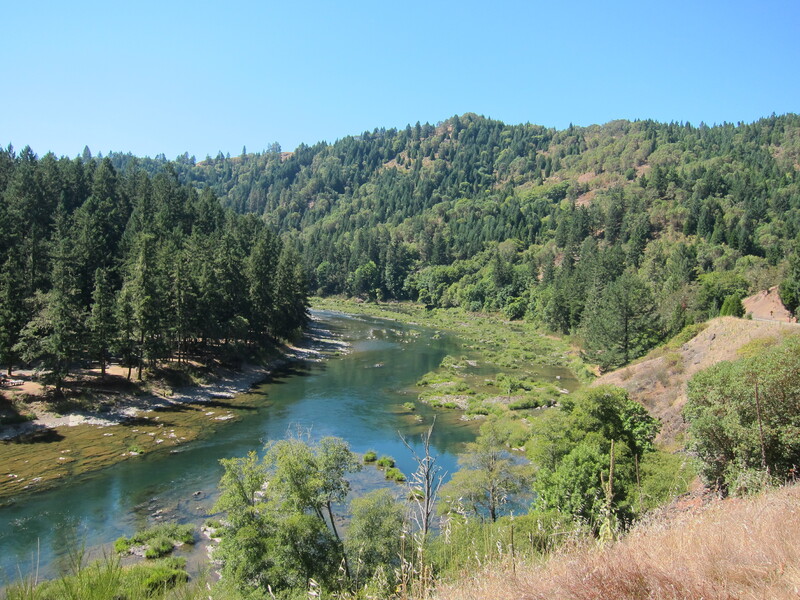 I continued on 138, as it follows along the North Umpqua River. I went past the Steamboat Inn and from there I retraced the same route made by Rod and the Cycle Parts team on our ride back from the restaurant two weeks ago. Perfect, because I wanted to document where we had been on that ride. 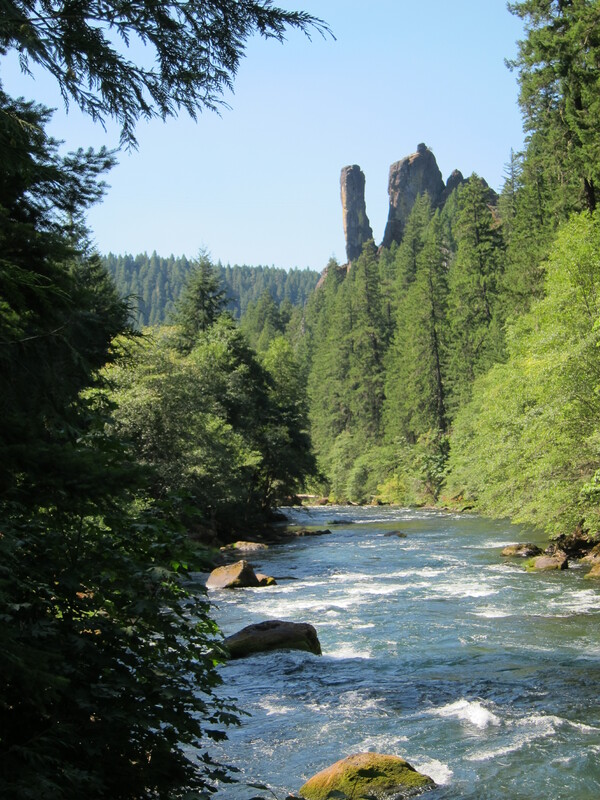 Like this formation this canyon like feature along the Umpqua River. 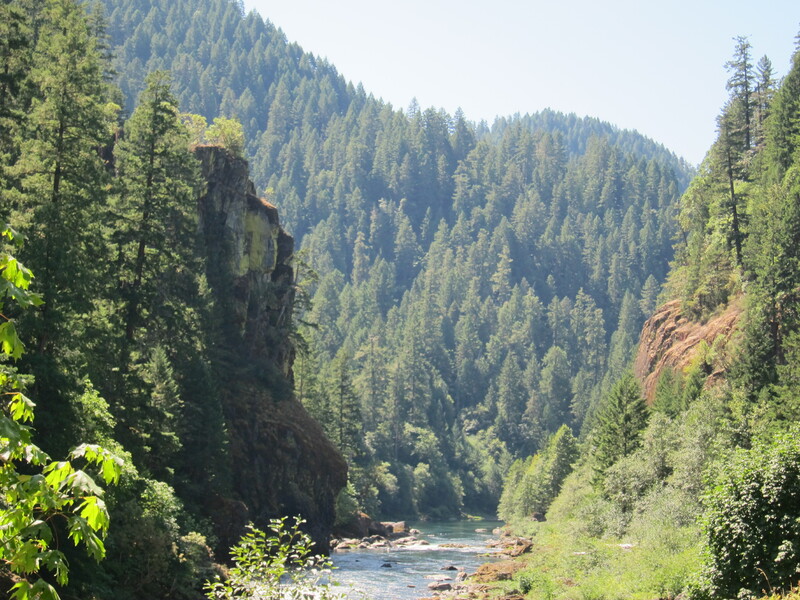 Then I took the cutoff road, on the North Bank of the Umpqua River. This road is fun on at least three counts. First it has nice curves, second it has little traffic, and third it has nice landscapes with farms, sheep, cattle, lots of interesting things to see. 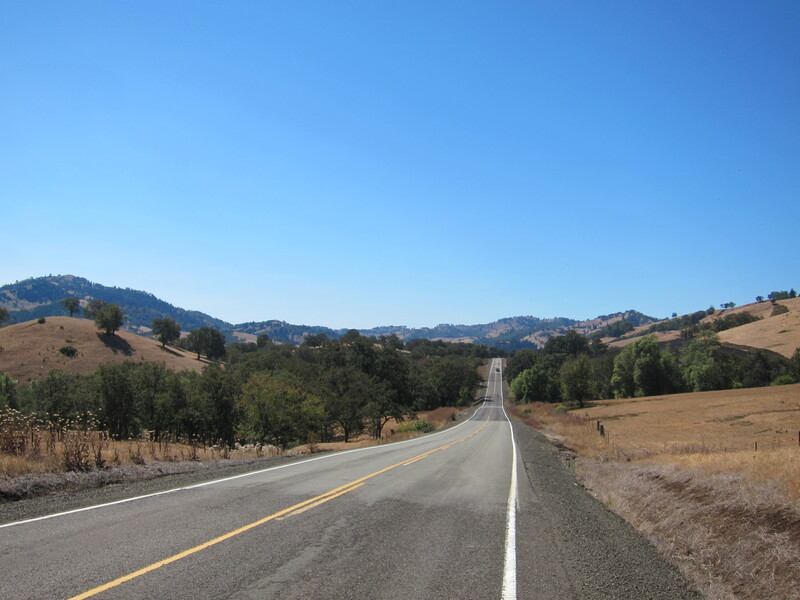 And overall, it reminds me of areas of north California, along hwy 101. From there I took 99 towards Sutherlin and then found my way towards Oakland, where I parked the bike for a few photos. The Museum was closed, today was a holiday. 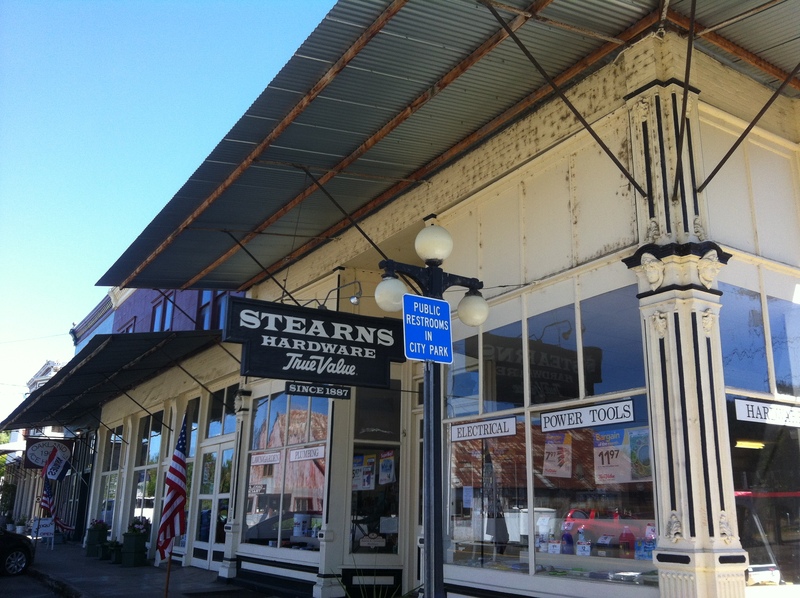 Most buildings show built dates around the turn of the previous century. This town must had been booming during those years. 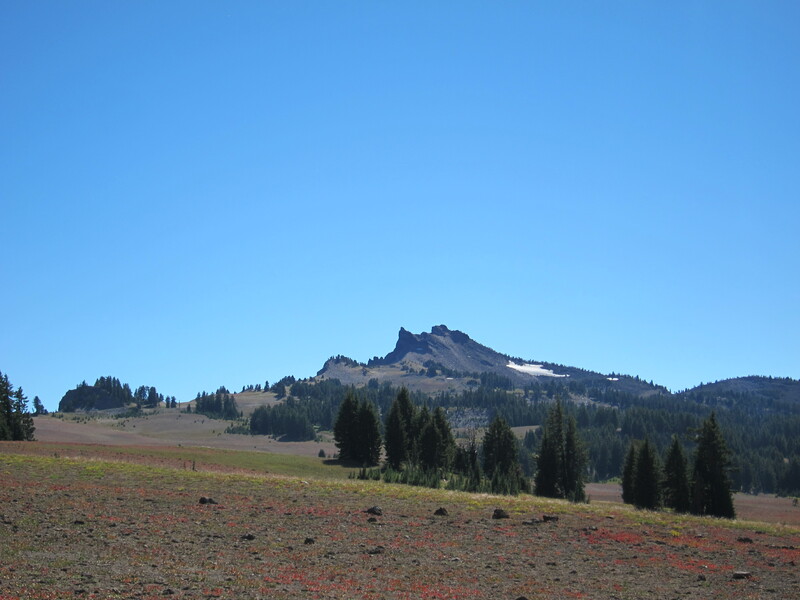 It is a preserved view of what Oregon was like in this area more than 100 years ago. 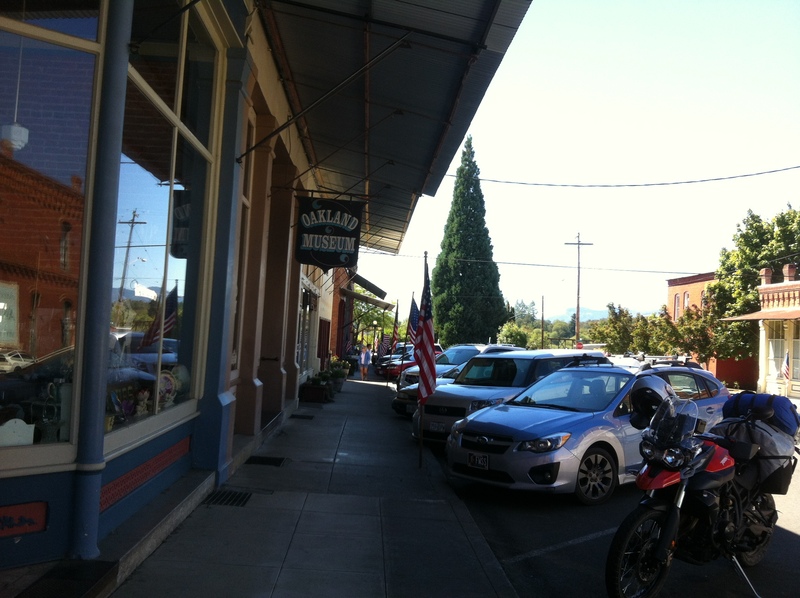 Now, this area of the Umpqua Valley is mostly known for its wineries. I continued to re-trace the Steamboat Inn ride route, found my way to the other side of the I-5 and back at 99. From there I went past Drain and from there Lorane and all the very familiar roads I use often for short rides in the area and got back home. Total for today was 212.4 Miles (342km). 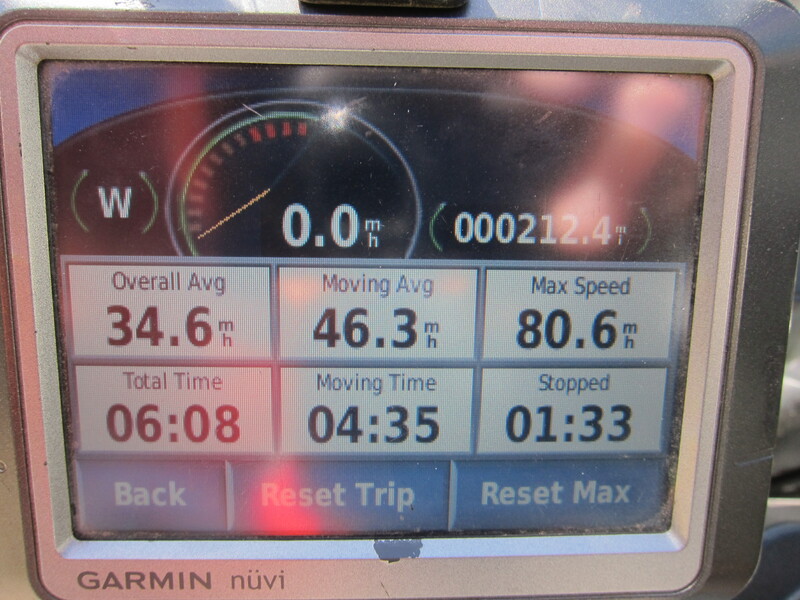 The total for this three-day trip was 483 miles (778km). Not bad for a three-day weekend. 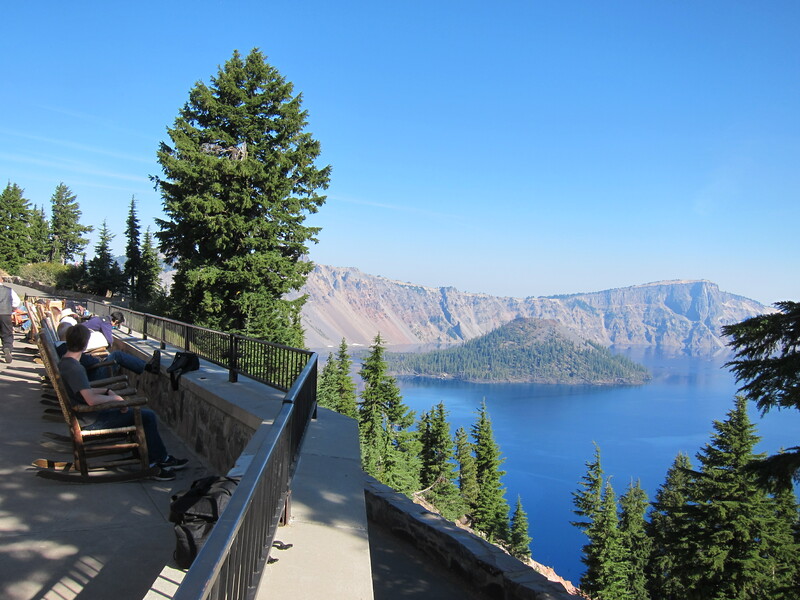 Not as far as I could had been, but it was great to see my friends and see the Crater Lake again. They were perfect days for riding on a bike that worked flawlessly as always and which made it very comfortable for me. 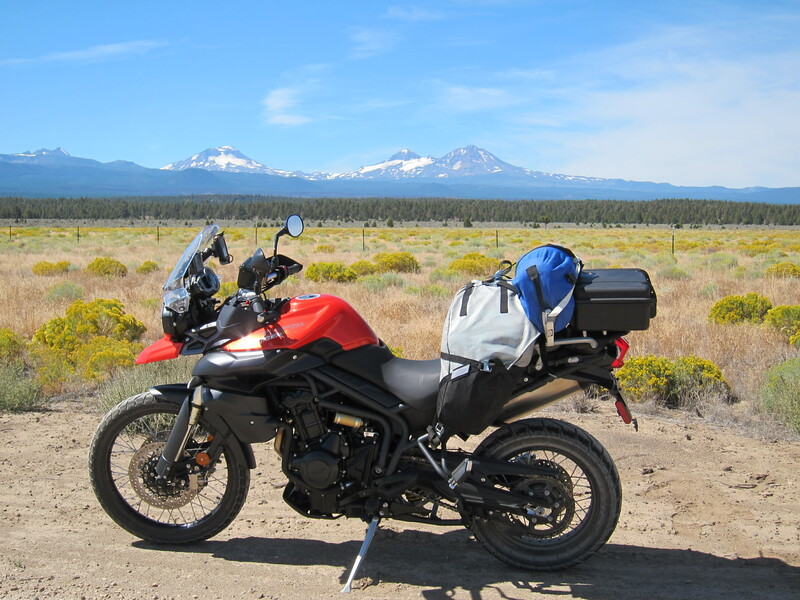 This entry was posted in Riding the Triumph, Travel and tagged 800XC, crater lake national park, deepest lake, Tiger Triumph, Triumph. Bookmark the permalink. 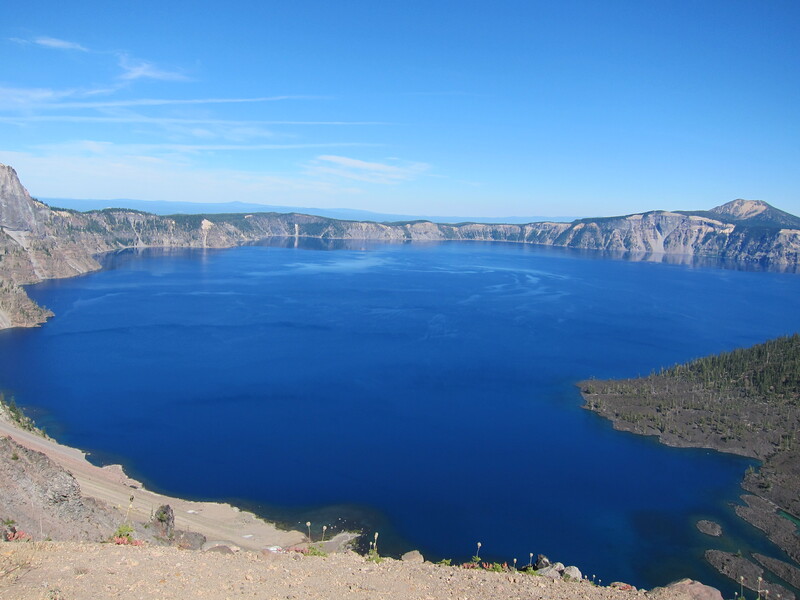 Gorgeous photos of Crater Lake. That orange Tiger sure looks nice against the blue lake and sky. 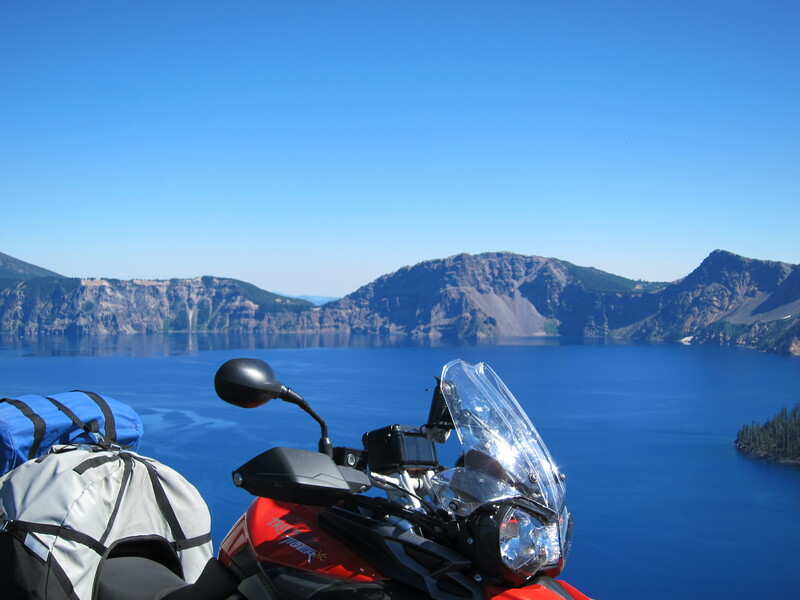 I’ve only been to Crater Lake once (and it was on the bike). 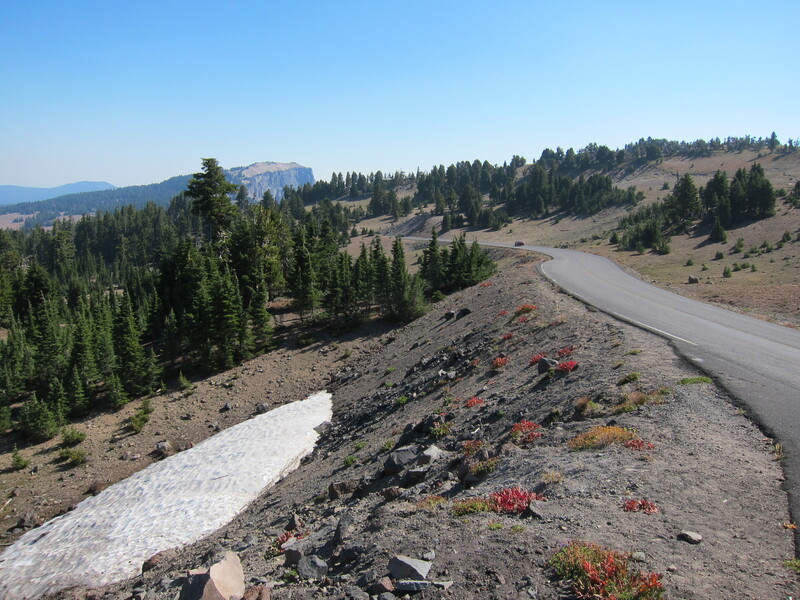 There were a ton of tourists on the rim road and it was slow going, but worth it for the views. Indeed, I also found lots of tourists in the area. Especially Sunday. 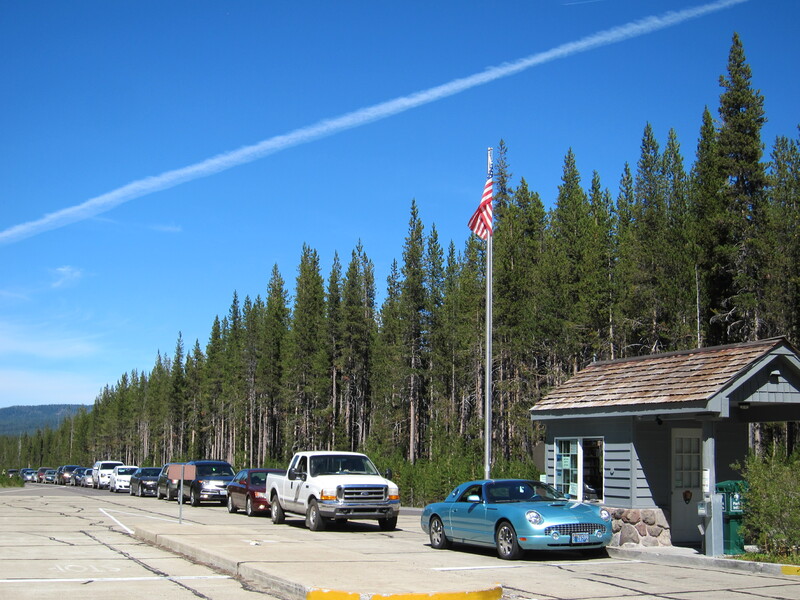 Monday although a holiday, there was a significant reduction of traffic around the rim. Perhaps because it was in the morning? But it was a lot better with respect to the people coming and going from viewing areas along the rim. 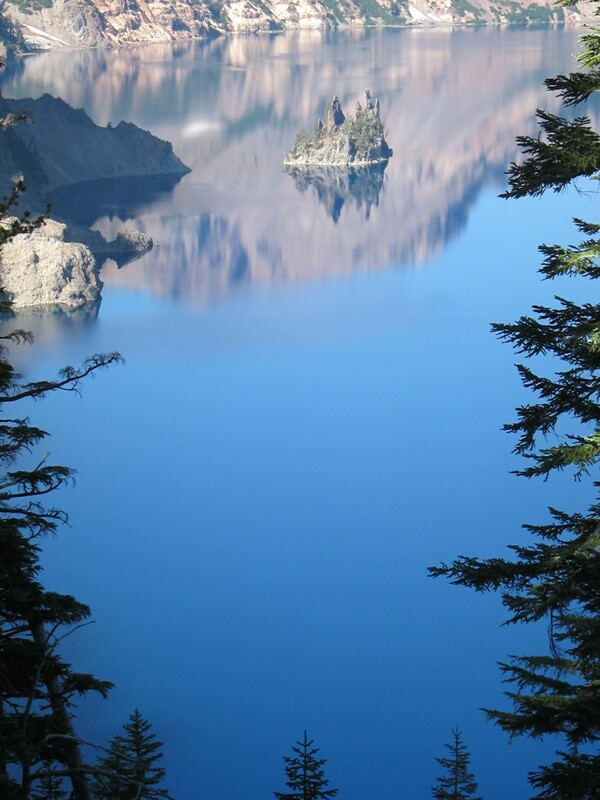 I’ll go back to the Crater Lake next year. Just found your blog. I loved the photos. It looks like you live in a spectacular area of the world and nice for bike riding too!